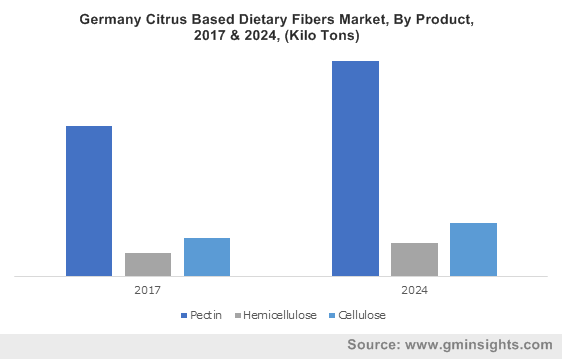 Global Citrus Based Dietary Fibers Market size was valued at over USD 1.2 billion in 2017 and is anticipated to grow at over 6% in the forecast timespan. Necessity to enhance nutrition value of food owing to increasing consumer health consciousness will propel the market growth. Shifting trend towards healthy lifestyles along with rising consumer spending on nutritious food will boost the application scope. High bioactive compounds content including flavonoids, carotene, and polyphenols provides a positive outlook for product demand. Rising demand from food preserves, bakery and dairy applications owing to beneficial functions including improved gelling, thickening, stabilizing, and water binding will drive the global market size. Germany bakery industry was valued over USD 15 billion in 2016. High usage as fat replacers will support product scope among bakery applications. Strong outlook in meat applications for texture enhancement, yield improvement and moisture enhancement will propel product penetration. Significant health benefits including stress relief, anxiety reduction and improved skin tone has enhanced the industry demand from pharmaceutical and cosmetic applications. Improved heart health, prevention against constipation along with lowered probability of kidney stone occurrence will drive the product demand. Favourable government regulations towards improving nutrition content in food & beverages will support industry expansion. Technological advancements and innovations in offering combination of soluble and insoluble products are among key factors supporting business growth. Fluctuating citrus peel costs along with uneven geographical distribution of raw material resources are major factors influencing the citrus based dietary fibers price trend. However, high R&D costs for developing new products along with availability of large number of substitutes may hamper the industry growth. Pectin market accounted for over USD 850 million in 2017. Enhanced thickening, stabilizing and gelling functions have stimulated the pectin demand in fruit processing mainly including marmalades, yogurts and desserts. Potential applications in pharmaceutical industry owing to significant water-holding ability and easy absorption by digestive tract will propel revenue growth. Capability to inhibit cancer cells growth has enhanced application scope in cancer prevention. Food preserves accounted for more than 25% of the global citrus based dietary fibers industry share in 2017. Improved gelling capability and texture control are among key properties driving the application scope. Rising jams, marmalades and other food preserves demand in regular diet due to changing food habits will fuel the product demand. Increasing adoption in bakery jams owing to its significance in protecting against heat damage will propel industry growth. Bakery application is projected to grow at over 4% from 2018 to 2024. Citrus based dietary fibers find potential applications in bakery products particularly as thickeners and water binders. Improved egg & fat reduction, enhanced durability through binding of fragile particles coupled with quality improvement in frozen doughs are among key benefits driving the application scope. Citrus based dietary fibers as gelling agents’ market is anticipated to register around 35 kilo tons by 2024. Ease in gel formation due to high water trapping capability at low concentration has stimulated the industry demand. 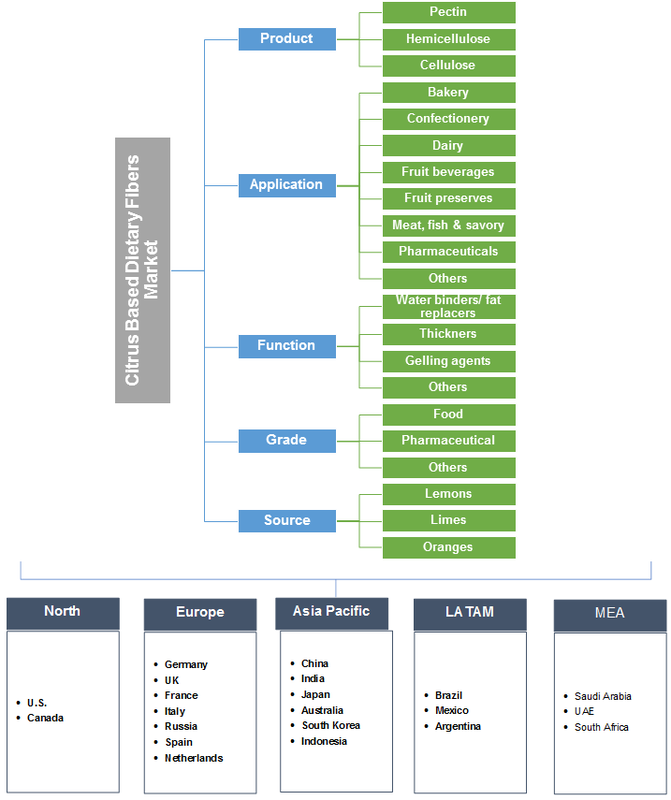 Increasing product penetration among jams, dairy and confectionery applications will drive the industry demand. Enhanced health benefits along with extended product shelf life provides positive outlook for gelling functions. Food grade accounted for dominating share in the global citrus based dietary fibers market owing to extensive food applications including bakery, confectionery, dairy, fruit beverages, fruit preserves, and meat & savory. Expansion in global processed food industry along with regularized standards for approved food additives including INS, U and E numbers will support industry growth. Superior functionality along with cost effectiveness are among key factors contributing to the sales growth from food grade products. Lemons are the dominating source in citrus based dietary fibers market share, accounting for more than 50% of the industry share in 2017. Natural content of fruit enzymes & pectin methylesterase provides positive outlook for lemons demand. Lemons offer substantial health benefits including lowered cholesterol levels, anti-cancer effects and reduced risk of kidney stone. European market will witness gains over 5% up to 2024. Increasing consumer health consciousness influencing enhanced nutritious food demand will fuel industry share. Growth in dairy as well as bakery industry along with new dairy product developments will support the regional demand. Notable health benefits along with improved functional properties has stimulated product utilization in meat & bakery applications. North America market revenue is expected to surpass USD 500 million till 2024. Favourable government norms related to food standards coupled with significant benefits as food additive will support the business growth. Increasing product usage in canned meat, fish & savoury accompanied by necessity to improve nutritious value in bakery applications will augment the industry demand. The American Heart Association recommends, daily dietary fiber intake to be 25g - 30g. Rising demand from nut-based milk application will open new opportunities for product scope. Global citrus based dietary fibers market share is moderately fragmented with presence of large number of global players accompanied by few regional manufacturers. The key players include Ceamsa, Fiberstar, Herbstreith & Fox, Cargill, DuPont Danisco, CP Kelco, and Yantai Andre Pectin. New product developments and strategic partnerships to expand their industry share are among key strategies adopted by the manufacturers. For instance, Fiberstar launched Citri-Fi 125 in 2017 for tomato-based foods including sauces, condiments, and spreads to replace gums. Other notable players include Quadra Chemicals, DuPont Danisco, Triphase Pharmaceuticals and Reinert Gruppe Ingredients.